Nestled atop the beautiful resort town of Ocho Rios on Jamaica's lush north shore, the Crane Ridge Resort will make you forget the big city. This 90 -unit resort, perched on Crane Ridge in the heart of rain forest country, lies in the midst of 19 acres of luscious landscaped gardens filled with exotic birds during the day and the music of crickets at night. 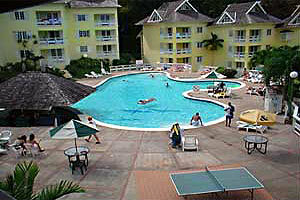 The Crane Ridge Resort offers one and two bedroom suites with large balconies and standard rooms with shared balconies overlooking the Caribbean Sea and Ocho Rios. Two bedroom suites offer a master bedroom and Jacuzzi style tub in a quaint loft. Our chef is renowned for his delicious specialties, international cuisine and our Crane Ridge Pizza, which fits everyone's tastes and budget.